Everyone knows that triceps push-ups work the triceps, duh, that’s why they’re called tricep push-ups. But do you know why they work the triceps more? You might say “because the elbows are tucked in”, but that’s like asking “why do you like french fries?” and answering with “because they’re good!”. It’s not because we just want them to. I know that they’re quite a few people that do not know the reason why, and that group included me as well, I had no exact knowledge as to why the triceps become more active when the elbows are tucked in, I just knew they burned like mofos when keeping those elbows tucked in. But I wanted to know ‘why?’. I have not gone past page one of Google because I believe Google is so good that the results I’m after would be listed on page one, so don’t get mad at me if it’s out there somewhere, but for now I can’t find the answer to the question “why do tricep push-ups work the triceps?“. So, I’m going to put my neck on the line because I don’t care if I’m proven wrong and learn something new. I’ve used my common sense on this one, and after analysing the angle, and looking at the muscles, origin and insertion, I will make an uneducated guess. With the chest push-up which is where the hands and arms are positioned in the same angle as you would with a barbell chest press (you know, the one you see in every gym), the big difference being that the body is turned upside down. The pectoralis major muscle group is contracted to push ourselves away from the ground. Following is the origin and insertion for this muscle which is important to know as it gives you an idea of what happens when the muscles are contracted, and how that moves the bones. a. Clavicular head: medial half of the clavicle. b. Sternal head: sternum, upper costal cartilages (1-6), and the aponeurosis of the external oblique. Which means that one part is attached to your clavicle, which is also called your collarbone, the other part is attached to your upper costal cartilages, which in easy to understand terms is near the middle of your chest where the ribs start. a. Lateral lip of the intertubercular (bicipital) groove of the humerus. b. Crest of the greater tubercle of the humerus. On the other side, both parts of the pectoralis major are connected near the top of your upper arm at the bicipital groove. In other words and simplistic terms, this goes from the medial area of your chest till about 1/6 down off your upper arm. Contract these muscles and they pull your arm inwards towards the midline, hence it pushes you away from the ground, or the barbell away from your body. BTW, in a chest push-up you still engage your triceps, but more towards the last 10% of the push-up, this is to lock-out the elbows. If your pectorals where not there, well, you probably would not be able to initiate the press, but to prove a point, let’s say you were able to, then the triceps would have to do a hell of a lot more work, yes? OK, just keep that bit in the back of your mind while we continue. Now, none of that really explained why the triceps come more into action when the elbows are tucked in, but it makes you understand why the pectoralis are the prime movers for the chest-press and chest push-up. OK, lets tuck those elbows in. I’m not sure if the guy above has his elbow tucked in tightly, but lets just say that he does have them tightly tucked in for the sake of this article. What I would like you to do now is stand upright with one arm laterally outwards (hand inline with shoulder), if you’re male, bring your other hand from the midline —if you’re female you can too, but it’s going to become slightly odd— and slide across your chest to the bicipital groove which is the insertion of the pectoralis major. This was one straight line yes? Yes! Great. Now think about you being in a game of tug-o-war, you’re facing your opponent in a direct line. Same as the line your pectoralis insertion and origin is in when your arm is raised laterally. Now think of a pole in the ground and your tug-o-war opponent walks the rope around and now stands almost next to you. Things are going to become quite hard now since there is a fold in the rope so to say, yes? I hope you’re still with me, because I know I’m taking a long time to make my point, but if all of the above is clear, you’ll soon see what I mean. Now stand straight and let your arm hang (same position as in a tricep push-up), slide your hand across the chest again till the insertion point, hey, there is a fold —and your armpit is in-between! This fold takes out the pectoralis as the prime mover, and now your triceps become the strongest muscle group in the action of the push-up as they make up two-thirds of your upper arm mass. The next muscle inline is your front deltoid and this is not as strong as the large chest muscle, hence your triceps get a banging if your chest can’t help with the work due to the fold in the line, i.e. there is no direct line from insertion to origin. 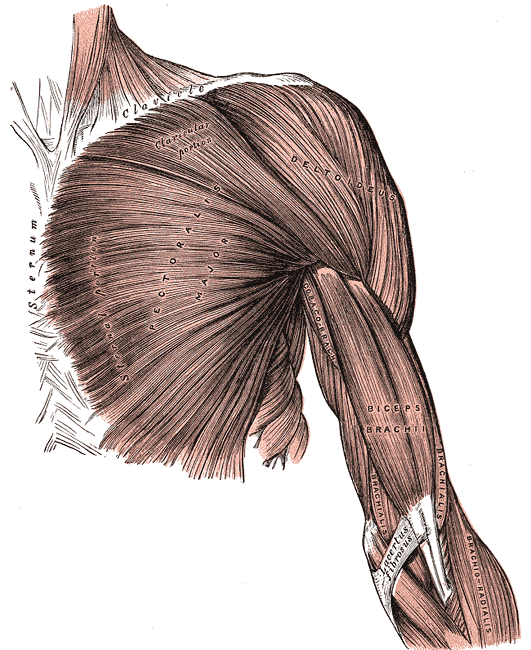 It’s because the stronger muscle, pectoralis major, can’t be the prime mover. Lets take this a bit further. The pecs simply aren’t made to act upon the upper arm in the position where the elbows are tucked in, at least not in the way we would want it to —push us away from the ground. The pecs medially rotate the arm when it’s hanging. Stand straight, thumb pointing forward, now try and point the thumb in while rotating at the shoulder, this is the action on the arm by the pecs in tricep push-up position. You might have seen me categorise/name push-ups as chest/hybrid/tricep or 90/45/0 degrees. I do get some strange looks sometimes, but I don’t care, because I’m right on this one, no debating there! 90 degree angle between elbow and ribs works the chest, same reason you call a chest press a ‘chest press’, 0 degree angle works the triceps, hence we call them tricep push-ups, and if you’re in between (45 degrees) the chest and tricep push-up it’s hybrid, which means of mixed character; composed of different elements. Now, I did not read this stuff anywhere and I’m just looking at the anatomy of things, so I’m here to stand corrected, but it sure does make a lot of sense to me. If it doesn’t, then you tell me why are the triceps more active in the tricep push-up?! Your thoughts on this facebook post or below. And buy our new book here. Just do it. BTW for you sicko’s out there, here’s a clip of a pectoralis major rupturing! One of the reasons I don’t barbell chest press, but kettlebell chest press. Don’t watch if you don’t like EEEK! moments.